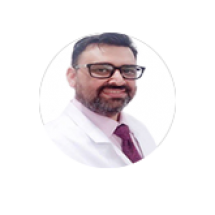 Dr. Sharma has immense experience as an Onco-surgeon in treating all types of Cancer patients in leading centers in New Delhi. As a Professor of Medical Oncology, he is a specialist in Advanced Laparoscopic Surgery. He has subsequently trained in Surgical Oncology from Aastha Oncology Associates, Ahmedabad, and trained in Advanced Laparoscopic Surgery from Coimbatore. He has over 19 years of experience of satisfied patients in his field. He was a consultant at Al Sanaiya Hospital, Dubai for 6 years. In that period Dr. Sharma was in charge of implementing internationally sound practices in all surgical areas. All treatment was planned and implemented according to the best evidence-based norms, like ATLS and UICC. He was a Surgical Oncology Fellow at Aastha Oncology Associates during 2002 – 2005.